Dude fully deserves to be pro. Good for him. Now they should boot eldrige, devine and roberts and well be getting back to the old choco steeze. They all need to stay, you lunkheads. 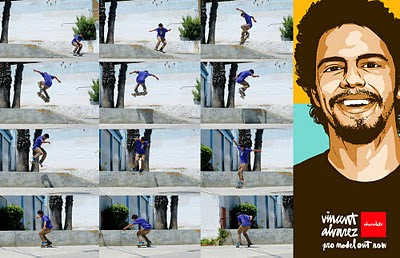 I'm fully down with Devine when he skates, and I've liked Roberts since the Listen vid by Dowling. The dudes seem to like Eldridge, so who am I to argue? Vince Alvarez is on some soon to be legendary status--everything you see stokes you out.